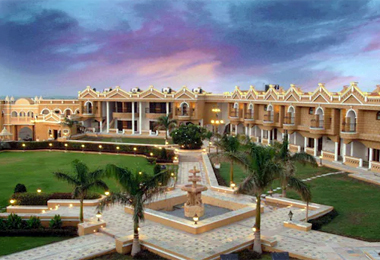 Rajkot attracts a large number of tourists from all over the world because of its rich heritage and vast culture. For the comforts of business tourists and the luxury travelers, heritage Hotels in Rajkot are the best exponents for luxury and heritage. All Rajkot heritage hotels include exceptional business-friendly amenities and offer excellent customer care services to the guests. An outstanding array of mouthwatering dishes along with admirable range of beverages are served to guests. The customers will find themselves in highly maintained A/C rooms installed with all modern requirements meant to make their stay comfortable and luxurious. All these hotels intermingles the Majestic charms of Rajkot and the modern touch of today’s era and the guests learn the true meaning of Royalty. The exciting architectural interiors simply leave everyone awestruck. All these hotels are renowned for their classical sense of hospitality and providing the best possible services. Awesome guest rooms offering varied range of services make these hotels simply the best place to stay in Gujarat. There are numerous heritage hotels in Rajkot and travelers can chose to stay in anyone of them, all at very reasonable rates.